The use of tobacco products remains the nation’s number one cause of preventable death, killing more than 480,000 Americans each year.1 That is why the American Cancer Society Cancer Action Network (ACS CAN) and the American Cancer Society (ACS) have long been engaged in the fight against tobacco. One of the most effective ways to deter and reduce tobacco consumption is to raise the price of tobacco products. ACS CAN strongly advocates for increases in federal, state, and local taxes on all tobacco products. We also advocate for parity among taxes on cigarettes and on other tobacco products. Since 2002, 48 states, the District of Columbia and several U.S. territories have raised their cigarette tax. Thirty-six states, the District of Columbia, Puerto Rico, the Northern Marianas, and Guam now have excise taxes of $1.00 or more per pack. Eighteen states – Alaska, Arizona, California, Connecticut, Delaware, Hawaii, Maine, Maryland, Massachusetts, Michigan, Minnesota, New Jersey, New York, Pennsylvania, Rhode Island, Washington, Wisconsin, and Vermont -- the District of Columbia, Puerto Rico, and Guam have taxes of $2.00 or more per pack. Eight states – Connecticut, Hawaii, Massachusetts, Minnesota, New York, Rhode Island, Vermont, Washington –Puerto Rico and Guam have taxes of $3.00 or more per pack. New York has the highest state cigarette tax rate at $4.35 per pack. Puerto Rico’s tax is $5.10 per pack. California recently increased its cigarette tax by $2.00 per pack. As of September 1, 2017, the national average of all states and the District of Columbia is $1.71 per pack. ACS CAN advocates for state tobacco prevention and cessation program funding consistent with best practices and funding recommendations from the Centers for Disease Control and Prevention (CDC). CDC’s Best Practices for Comprehensive Tobacco Control Programs8 provides evidence-based recommendations to help states plan and establish comprehensive tobacco control programs that include the following components: state and community interventions, mass-reach health communication interventions, cessation interventions, surveillance and evaluation, and infrastructure for administration and management. Comprehensive, well-funded tobacco control programs help prevent youth from starting to use tobacco products and support and promote cessation for current tobacco users. Unfortunately, most states are not even close to meeting CDC funding recommendations. ACS CAN recommends that states dedicate a portion of tobacco tax and other tobacco-related revenue for tobacco control programs. ACS CAN is dedicated to the advancement of 100 percent smoke-free communities. Twenty-five states, the District of Columbia, the U.S. Virgin Islands and Puerto Rico have smoke-free laws in effect that require 100 percent smoke-free workplaces, restaurants, and bars. 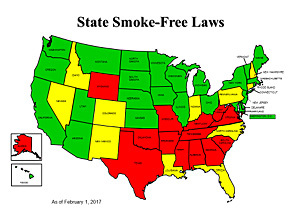 In total, 58.3 percent of the U.S. population is covered by a state or local 100 percent comprehensive smoke-free law.13 Unfortunately, there are still 11 states in the “yellow” category, with 100 percent smoke-free laws in one or two of workplaces, restaurants, and bars, and 14 states in the “red” category, with no 100 percent comprehensive statewide smoke-free laws. This map reflects the status of smoke-free laws across the country. Green states have 100 percent smoke-free restaurants, bars, and workplaces. Yellow states are 100 percent smoke-free in one or two of the above. Red states have no 100 percent smoke-free laws that apply to restaurants, bars, or workplaces. The U.S. Food and Drug Administration has significant authority over the manufacture, sale, and marketing of tobacco products due to the passage the Family Smoking Prevention and Tobacco Control Act (TCA) in 2009. Since the law was enacted, the FDA has prohibited free samples of cigarettes, the use of candy and fruit flavorings in cigarettes, product sales to minors, and the use of unsubstantiated health claims on product packs and in advertisements. FDA has authority over cigarettes, smokeless tobacco, and roll-your-own-tobacco, and in May 2016 finalized a decision to “deem” all other types of tobacco products such as cigars, hookah tobacco, pipe tobacco, e-cigarettes, dissolvables, and gels, under its regulatory authority. Additionally, the TCA preserves the authority of states and localities to implement effective tobacco control policies such as smoke-free policies, tobacco taxes increases, and to further restrict the sales of tobacco products for the protection of public health. Establishing enforcement actions when products are not in compliance with the law. ACS CAN will continue to advocate for full implementation of this law and fight Congressional and court challenges to it, to ensure that tobacco products are regulated appropriately for the protection of public health. 1. U.S. Department of Health and Human Services. The Health Consequences of Smoking—50 Years of Progress: A Report of the Surgeon General. Atlanta: U.S. Department of Health and Human Services, Centers for Disease Control and Prevention, National Center for Chronic Disease Prevention and Health Promotion, Office on Smoking and Health, 2014. 3. Xu X, Bishop EE, Kennedy SM, Simpson SA, Pechacek TF. Annual Healthcare Spending Attributable to Cigarette Smoking: An Update. American Journal of Preventive Medicine 2014;48(3):326–33. 5. U.S. Department of Health and Human Services. How Tobacco Smoke Causes Disease: The Biology and Behavioral Basis for Smoking-Attributable Disease: A Report of the Surgeon General. Atlanta, GA: U.S. Department of Health and Human Services, Centers for Disease Control and Prevention, National Center for Chronic Disease Prevention and Health Promotion, Office on Smoking and Health, 2010. 8. Centers for Disease Control and Prevention. Best Practices for Comprehensive Tobacco Control Programs – 2014. April 2014. Available at https://www.cdc.gov/tobacco/stateandcommunity/best_practices/. Accessed February 14, 2017. 9. Robert Wood Johnson Foundation, American Cancer Society Cancer Action Network, Campaign for Tobacco-Free Kids, Truth Initiative, American Heart Association, American Lung Association, and Americans for Nonsmokers’ Rights. Broken Promises to Our Children: A State-by-State Look at the 1998 State Tobacco Settlement 18 Years Later. December 2016. Available at http://www.tobaccofreekids.org/microsites/statereport2017/. Accessed February 6, 2017. 10. Robert Wood Johnson Foundation, 2016. 11. Robert Wood Johnson Foundation, 2016. 12. American Nonsmokers Rights Foundation. Overview List – How Many Smokefree Laws? July 3, 2017. Available at http://www.no-smoke.org/goingsmokefree.php?id=519. Accessed September 7, 2017.